She did a much better version subsequently! Well Done all! Please grab yourself a Top 5 badge for your blog! There is still time to play in our current challenge which is "Desert Island" to use items you'd literally be lost without, things you'd never tire of. This is to help newbies (and more experienced!) make good choices on products on what is a sure fire bet to be a winner as I will be compiling a list based on your entries for our sidebar. Well we didn't expect that! Wow so many entries for the challenging challenge and you're all having so much fun with it! Thank You for playing along with it and I hope you had a lot of fun, lots of hair tearing but you overcame and mastered, well done! We'll be back later in the week with our Top 5 and winner of the Donna's Den prize, thanks again for sponsoring us Donna! Also a Thank You to Itzuvit for being our special guest designer! This is another thinking challenge! Imagine if you were on a Desert Island for at least 6 months, what crafty essentials would you *need* to have with you? What would you never tire of or get bored with if these were the only things you had? You need to make your ENTIRE creation using only the items you have on your island, items you really couldn't do without. You can be quite broad with this such as "Magnolia Stamps" or "Sticky Gems" you don't have to limit yourself to a particular one. The thought behind the challenge is to see what items really are favourites, long lasting and a good investment. Newer cardmakers (and those more experienced!) are faced with an enormous amount of craft items but where do you start? How many items have we bought but never used or wished we'd bought that other item instead? This challenge should show up some sure fire items which won't turn out white elephants. If you're a more experienced cardmaker please also play along as your input will be very useful to newer cardmakers. 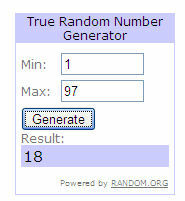 I will also collate a hot list at the end of favourites to show in the sidebar. No you CANNOT take Tim Holtz!!!!! We're sponsored once again by Joanna Sheen with a £10 gift voucher. New items at Joanna's are Michelle Marsden range of rubber stamps which are a wide range including vintage, oriental, flowers, flourishes and alphabets. Pop over and have a look at Joannas extensive online store with absolutely something for everybody! Thank You once again Joanna for sponsoring us! With all our future challenges if you wish to be considered for the next but one challenge please put GDT after your entry. Please post your entries in Mr Linky by Sunday 2nd May 12pm GMT. If Mr Linky is MIA post your entry in comments and we will add them when he reappears! K&Co papers ...lush!! - Ive distressed them a little with scissors anda nail file..do i get to take them too ;-)...ive used a magnolia image but i really had difficulty chosing... but she's nice to colour...flat back pearls...large and small roses, hat pins, charm, ribbon to make a bow with my bow maker, some reaaly nice sheer lace, leaf punch..and i used my MME bloom and grow papers for these..so im taking those too :-P Everything is covered in glimmer mist added sparkle to flowers with my opal dust also my new friend Mr Stickles in cotton candy and stardust around some of the distressed edges glossy accent and of course my faithful promarkers in the following colours ivory, blush, dusky pink, tan, sandstone, cinnamon, cocoa, henna, babypink, cocktail pink, antique pink, pastel pink, pear green, moss and vanilla. Assuming NO electricity on the desert island to plug in my beloved computer& most of my suitcase is taken up with other essentials...wine, wine glass,cork screw...I've taken just a few small crafting goodies just in case I'm rescued. Always be prepared with a card! 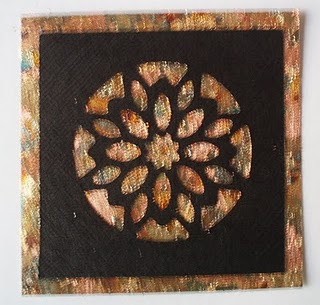 My passions this week are Black Peel-Offs, embossing on a lightbox (ofcourse I'd use the light of the sun) & Gems. What would I take on a desert island ? I would have to take a pack of cards, double sided tape, a pack of metallic paper, a colossal paper pack, a stamp, ink pad and of course my promarkers. The stamp I have used which is Popcorn the Bear could make so many combinations of cards with a variety of different coloured promarkers. The colossal paper packs you can get comes in all colours. Just picture the beautiful island, peace and quiet, sat colouring, heaven !! My card is made with just a square card, one sheet from the paper pack, a sheet of metallic paper and my stamped image coloured with promarkers. Hope you enjoy the challenge. I've used quite a few of my 'essential' items on this card, although my essential list is quite endless really - it would have been a very busy card if I'd used them all! My items include: digi stamps (I've used a Mo Manning one here... and I'm probably taking liberties with the theme - no idea where I'd get access to digi stamps on an island, but let's not worry about that! ), promarkers to colour the image, coredinations card, lots of flowers, flat backed pearls, I'd need some lovely papers (this one is MME, one of my favourites), buttons, nestabilities (I've used circles and blossom dies here, and I suppose we'd have to include the big shot I cut them on)... oh and some sparkle - the paper is glittery and I used a sakura clear stardust pen on the little girl's headband. My Desert Island card uses the items I love the most, pretty papers from MME and Papermania, rubber stamp image coloured with Promarkers and Twinkling H20's, Nellie Snellen dies, flowers and ribbon. Another must have is bling either in the form of glitter or gems. What would I take on a desert Island? Well I would have to say, lots of white card, - for stamping on, my copic pens and Watercolour pencils, Memento Inks, lots of ribbon and lace, charms, flowers, Spica pens, chalk and cotton wool, lots and lots of patterned and plain card & paper, My cuttlebug and Nestability dies, double sided tape, foam pads and glue and the big one would be magnolia stamps. My card is created using all my desert island bits. The images, all magnolia stamps from the spring club collection 2010, are coloured with copics and watercolour pencils. I used scalloped Nestability to cut the images and used chalk to distress the edges. 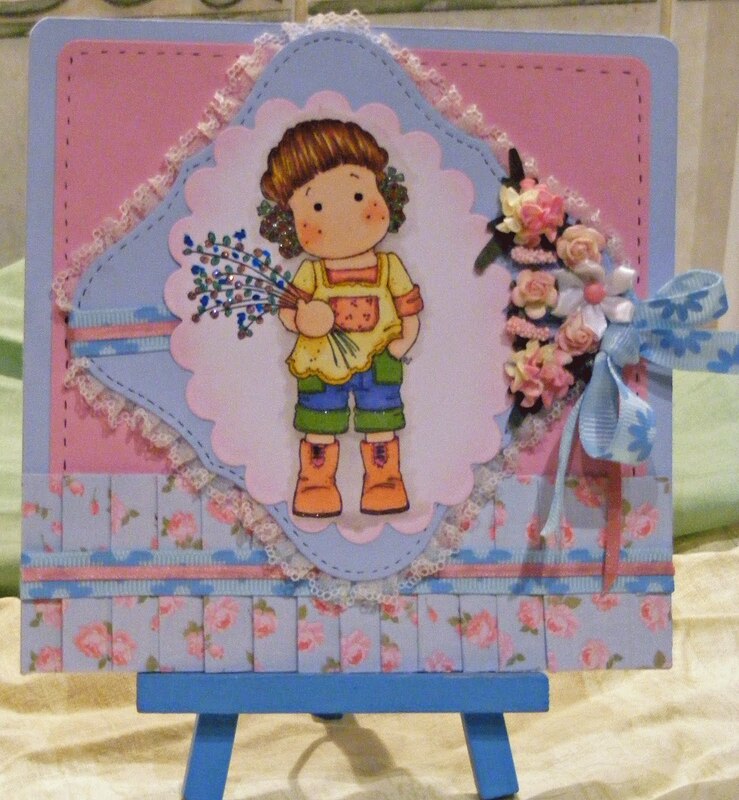 I added some lace that has ribbon threaded though it (charity shop find), to pink pattern paper, oblong that I mounted onto my card base – Gate fold card. 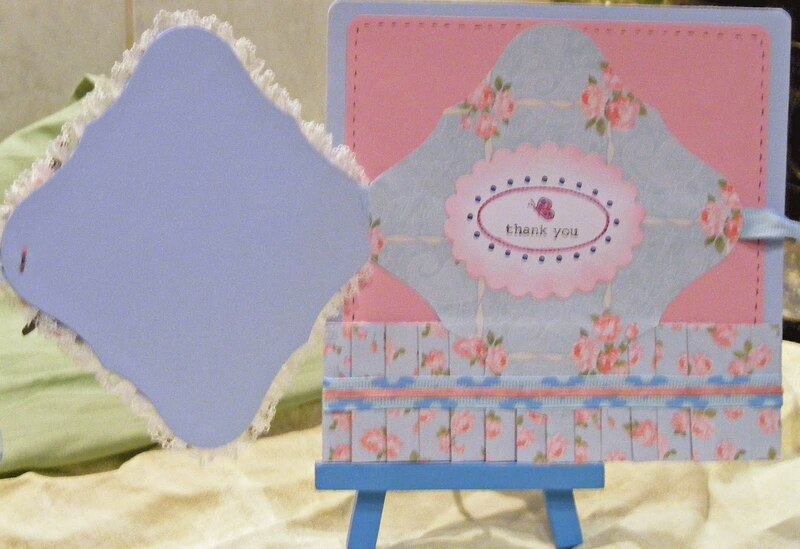 I add flowers and a thank you sign to the bottom corner and a bow and heart charm the top corner. I think for me it absolutely has to be starburst stains. I love the shimmer and the way they all come out unique when making backgrounds. I would also need flowers, I love prima flowers and paper roses. Also ribbon especially white satin as I can colour it with my promarkers which are an absolute must for me to take and I just love sticky gems and pearls, so much easier nowadays instead of fiddling with glue with the non sticky ones. Stamp wise most definately the butterfly beauties stamp plate with The Bling Maiden as there are so many possibilities I'd never get bored. Also embossing powder, I love moonglow midnight embossing powders which are black but change colour (I've used midnight teal here) I've also used a woodware leaf punch which is a firm favourite and cuts card easily. Brilliance ink is another must for me, it can be embossed, dries on most surfaces and has a lovely shimmer and finally stickles glitter glue as its high quality and dries 3d instead of the glue seeping into the paper and most of the sparkle disappearing. May I now introduce you to our special guest, Katie Tate. 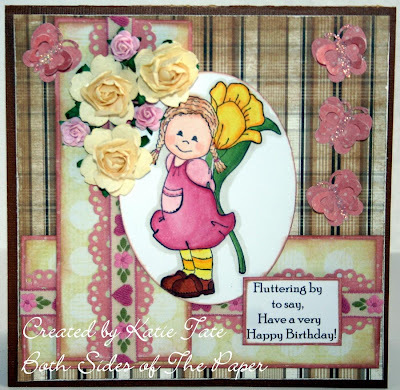 Katie is on the Design Teams of The Pixie Cottage, Digital Delights, Pile It On, Lily-Boo, Treehouse Stamps and if that's not enough also runs her very own cardmaking recipe challenge - Cooking it up with Katie! She's got more Top placement blinkies than you can shake a stick at with a distinctive style that includes showing the fabulous insides that also match the outsides. 1. 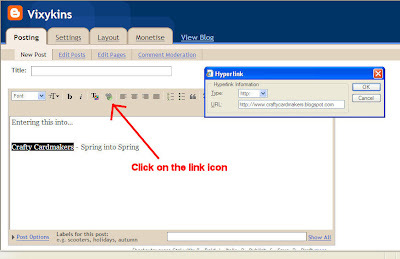 How long have you been involved in blogger and what led you to it? 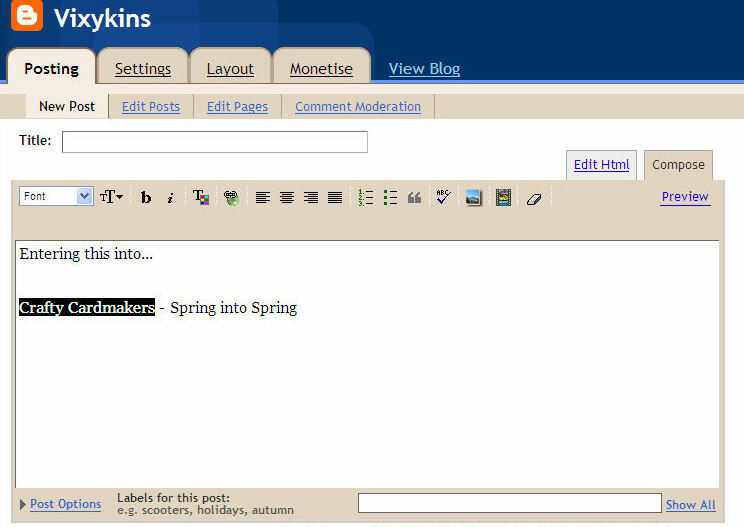 I've been blogging since May 27th 2009, so almost a year. I started my blog as a way to share my cards with others who liked the same things. I'd been enjoying other peoples blogs and wanted to join in the fun! I'd been holding off as I thought it would be hard but finally couldn't wait any longer. 2. You're on a number of design teams and also run your own challenge blog, how did you get involved and any tips for people wanting to get involved in DTs? I think my start into DT's was really a personal challenge for me. I'd been scrapbooking for 11 years and card making for only about 8 months when I applied for my first DT spot. All my family loved my cards and I got great comments on my blog but I wondered if it was only people "being nice". Being OK or nice for me is never enough, I always try to give my all into things I like and so really I think I was looking for validation that other people thought my work was good enough too. I also wanted to have a reason for creating cards just because I liked doing it and being on a team meant I could justify my creative time! LOL No longer was I "messing about with paper" I was "working on stuff for the team" :) At one point though I was on 8 teams and it was getting too much for me so unfortunately something had to give. The crunch came when I was offered two Senior positions within the teams and I wanted to devote a little more time to those and so I had to say goodbye to a couple of teams, but I still play on their challenges when I can.If you want to be on a team there are a few things I would recommend. Keep your "ear to the ground" and do some "blog stalking" looking for DT calls. When you apply read the application instructions carefully making sure you fill all the requirements and send the application in correctly. If it is a product team then look closely at the product and make sure it is something you can comfortably work with, don't apply for digital stamp team if you only like working with ink for example. Look at existing examples of the work they like from their website or blog, is it similar to your style? Can you fulfill the requirements of being on a team? It isn't just the creating of the card, you often have to comment on all or some of the entries on a challenge, you may have to make items to mail to the company or do tutorials. You also want to be able to promote the challenge/team whereever you can. You need to be a good, regular blogger who can keep to a schedule. Also be prepared to work with the team and not just complete a task when told to, having input into the team will make for a much better team for all members.If you are all these things not only do you stand a great chance of getting on a team but you will be a great team member and very appreciated by the team leader/blog owner. 3. Have you always made matching insides hense the name of your blog? What made you do that as its quite rare, even rarer to see the inside shown with every card! I've also done the insides of the cards as they feel "naked" if there is nothing there. Plus it is nice for the recipient to have a beautiful inside to go with the outside. The reason for the inside photograph is simple, I sell my cards on eBay (or I did when the market was moving) and so I take the photo for there so I just got in the habit of adding it to the blog too.Really the blog name has nothing to do with that though, it comes from a couple of things.Firstly there is a Nick Jr poem on TV with Joe from Blues Clues (remember I have a 3 year old! LOL) talking about the earth. A line from it goes "use both sides or recycle with me". This stuck in my head as I've always told my children to "use both sides of the paper" when they are writing or drawing rather than start a new sheet all the time. Also I've been paper crafting for a long while and when I started there were only one sided patterned papers. When the industry started doing double sided I remember arguing with my friends about what a silly idea it was, "you can't see the other side so why have a pattern there too, it's just an excuse for them to charge more". Of course that was when I was a scrapbooker mainly and so one side would always be underneath out of sight. Now that I make cards I love that I can buy one sheet and make a card showing the two coordinating patterns, definitely using Both Sides of The Paper. 4. Your creations are of a very high quality, how long do you spend making them? 1.Buy items you use all the time in bulk when they are on sale. Hobby Lobby and Joanns often have cardstock at 5 for $1 and I only buy then. 2.Organize your crafting space to fit the kind of crafter you are. I look for color first when I create and so my space has most things sorted by color making it perfect for me. 3.Keep up with the new trends but never forget the old ones that you love to do. I love my Copic's any started with them a year ago but I still try and paper piece at least a couple of times a month and I learned that technique almost 12 years ago. Thank You once again Katie! Pop over and visit Katies fabulous blog and have a look at her great challenge blog here! Now before you all run away screaming just sit down, take a deep breath and think about this one. We run for 2 weeks as you know so plenty of time to really think about it. There's nothing more rewarding than learning a new technique or mastering a product. We've all probably done it, gone to a show or seen some "must have" item then get it home for it to collect dust for the next few years. Sometimes we might get it out, look at it and put it back away again feeling a bit guilty so now's your chance to CHALLENGE YOURSELF. We would like you to challenge yourself to use a product that has collected dust, try a new technique or card fold that you've been "meaning to try" or maybe have a go at a challenge you saw on blogger and ran away from because it looked too scary. You need to point out what you've done in your blog post and we are relying on your HONESTY! Really, you can get a lot out of this one if you have a go at it, its very rewarding and like me you might wonder what took you so long to use the stuff! That should give you tons of choice and ideas! The challenge will close at 12 noon GMT on Sunday 18th April. Please post your entries in Mr Linky. If he is MIA then post in comments and we will post them when Mr Linky reappears. I really do hope you take on this challenging challenge as it can be a lot of fun! We have chosen for the Guest Design Spots for the next challenge and will contact you soon. If you would like to guest on Challenge 20 please add GDT after your entry. Our sponsor for this challenge is the lovely Donna from Donna's Den of Crafts. Donna's Den stocks a number of products from well known names live dovecrafts and DCWV. Pop along to her online store! Donna is also the brains behind the fabulous Cards for Men challenge blog which runs fortnightly, genius! "The theme of your challenge is 'To challenge yourself' so I am offering up the following items as a prize because they represent a personal challenge to me. I've never used the inks or the fabric stickers myself. " Lets see what the team have challenged themselves with, well done ladies! I have looked at the easel cards so many times and thought they looked too difficult, I now must say that I feel a little silly shying away from this style of card making as it is so easy, the hardest part is choosing what the image etc so go on it !! 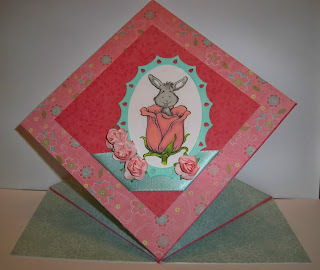 I used plain cream card to start with but once I had done the folding I used patterned card to make the front. 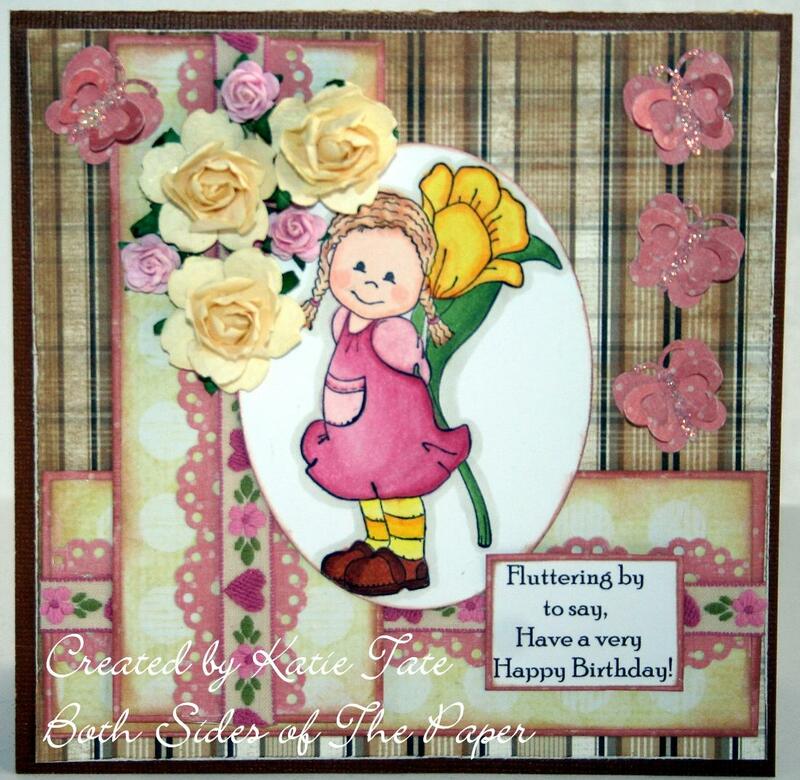 The patterned card and die cuts I have used from a patchwork pals kit I bought, I stamped Tilda and coloured her with promarkers. I added the finishing touches using brads I bought at christmas with a little charm a secret santa sent me ! 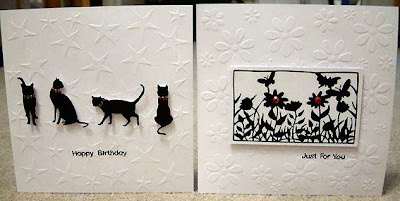 I still cannot believe how easy these cards are to make and would encourage anybody new to card making to have a go. I've challenged myself in a couple of different ways for my card this week. Firstly I always avoid 'black & white' challenges - I just don't think I'm very good at them and I really like colour. I also used my sewing machine for the very first time. I've had it for about 6 months I think and I've never used it, so please excuse the wonky stitching but it genuinely is the very first time I've risked using it on a card! 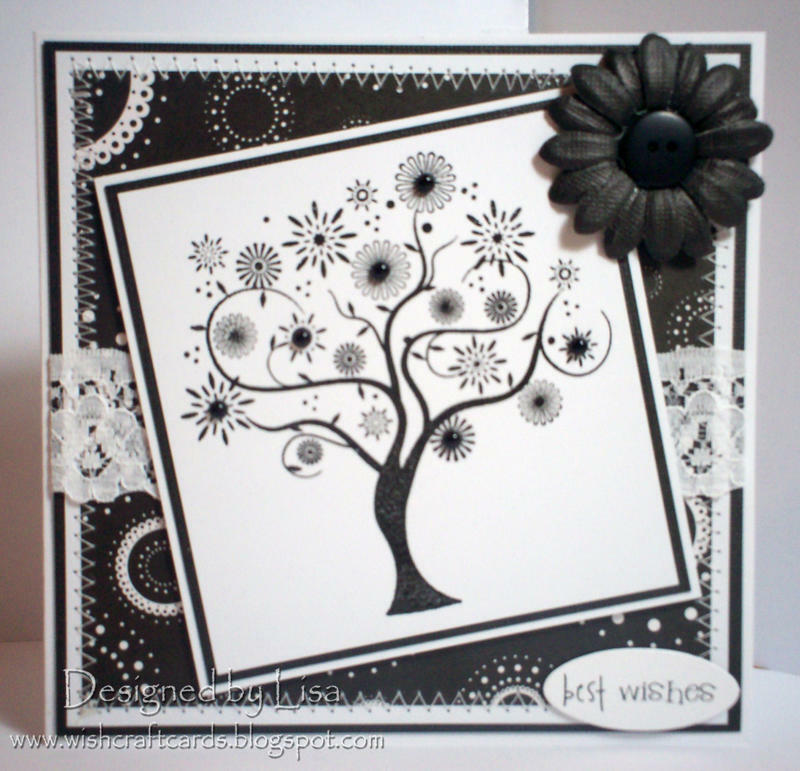 The image is from a Kanban stamp set, stamped and then embossed, with some black flat backed pearls added here and there. The flower (necessary because of a very wonky corner!) was cut with a Woodware daisy punch, with a button centre. The sentiment, also strategically placed to cover dodgy stitching, is from Craftwork Cards, and the lace is from my stash. The latest challenge is a challenging Challenge. This for me is a 2 part challenge. 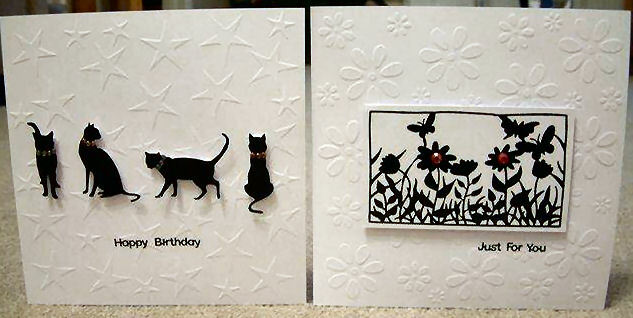 I have used a sketch from Day 155 of 365 cards which was from August 2009. As a sketch I just wasn't inspired by it so never did it. 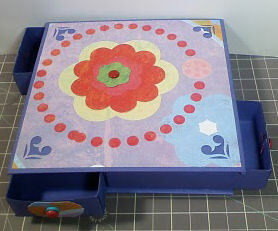 But the main challenge was to actually USE the Flowersoft that I bought at show at the NEC almost 2 years ago. I've got 6 pots of it and have never used it because I'd heard it could go all over the place and make an awful mess. Well I did make a mess, but not as bad as I'd suspected. The papers are all from a colour co-ordinated capsule pad from Papermania. I just love the oranges and yellows, they are so bright and cheerful and a perfect antidote for the bad weather we have been having lately. The shaped corners and the centre panel have been cut using Nellie Snellen Dies. The Flowersoft stalks have been placed inside a real terracotta plantpot and I have attached a ribbon bow from the co-rdinated accessories with the Papermania papers. The flowers, gems and sentiment are from my stash. I decided to look at two challenges that I had not done for this one. · Magnolia down under's, Fake or Real stitches challenge· Just Magnolia - Paper Pleating challenge. The reason that I did not do these challenges was that I felt that I did not have enough time to give them Justice but also I had no idea what so ever to do for them. I also decided to have a go at a hidden message card, as I had been wanting to do one for a while. For this card, I used the following stamps:· Magnolia: Tilda with Spring Bundle· Stampin up: Thank youPapers used:· Papermania – Signature Blueberry Hill – All patterned paper· The Papermill – Blue CardRibbon and flowers from own collection. Tilda was coloured with copic markers and Spica glitter pens. Then cut out using a Nestability Scalloped Oval. Then, I used three shades of pink chalks to distress the edge of the oval. 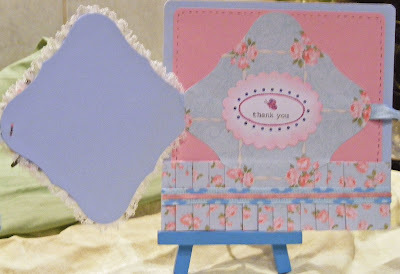 For the hidden message topper – I cut three Nestability labels – 2 from blue card and the other from patterned card. I added lace to the edge of one of the blue card labels. I cut a strip of the same blue card and folded this in half to create a hinge. I stuck this to the back of the lace edged label. Then I struck the other side of the hinge to the back of the patterned paper. I then added some blue and pink ribbon to be able to tie the hidden message shut. I then added some flowers to tie side of the hidden message topper. I stuck the Tilda image on top of the topper.I stamped a thank you and then cut out with a smaller scalloped Oval and used the same chalks to distress the edge. I added some colour to the image with Spica pens. This was then stuck inside the hidden message topper. I cut a square of pink card, which I rounded two top corners, with a corner punch. This I then stuck on to my card base. I cut 2 strips of patterned paper about 5cm (2in) in width and using the tutorial on paper pleating, I pleated both strips. I had to pleat both strips and join them together, to make a strip long enough to fit along the bottom of my card. I stuck the pleated strip, on top of the pink card at the bottom of the card base. I then stuck a strip of blue ribbon on top of the pleated strip and then some narrow pink ribbon on top, down the middle of the blue ribbon. To match the hidden message topper.I then stuck the hidden message topper to the card base. For our challenge theme this week Vix asked us to make something we would normally run a mile from, so I chose " The Colour Purple " and also colouring with distress ink's. For details on this awesome project please visit Vicky's blog. For this challenge I decided to decorate a slide mailer I bought about 2004! When I found the slide mailer I found some marvy metallic pens bought around the same time which hadn't been used for anything more exciting than edging cards so I've used a craft mat to drop the ink onto and placed the mailer on top to get some funky backgrounds. I've used 3 sweet pea stamps (Soft Goth Night, Rising Flame and Moonlight Whispering) coloured with promarkers and sakura stardust pens. I've stamped and embossed fairies from The Stampmans Starburst Fairies plate and overstamped with a text stamp. There is a step by step write up on my blog on how this was made and how to do the background if you want a peek. May I now hand you over to our Special Guest Designer - Itzuvit! 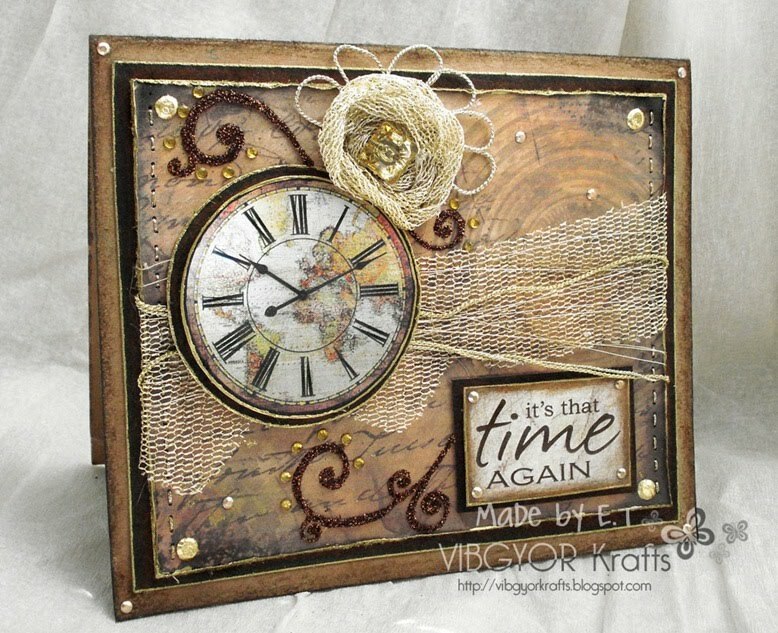 Itzuvit has an enormous list of awards on her blog for Top cards and guest design spots. She is also on the Design Team of One stop craft challenges. I loved Itzuvits work for the variety of styles and materials, you never know what's coming next plus she does not seem to be afraid of ANY challenge, technique or material and certainly knows challenges like the back of her hand. Pop over for a browse as there is so much to see, so many styles and also helpful videos. Ingredients for my card: Doilies in two sizes and colors (pink and white), A wooden button, 2 handmade felt circles in dark pink, C.C. Designs - Sugarplums Cherry Emma Rubber Stamp (I've masked the cherries), Net like golden fabric, Punched and prima flowers, A variety of crafty papers, the pink designed one is from G.C.D. studio. What motivated me for this card was to use different type of materials to create a warm feel for many occasions kind of card. I wanted to show how you can combine harmonically different materials and they all feel perfectly good together. I've based it on an easel card that I simply love, and I can use it as a best wishes, birthday or holiday card. 1. The reason you were asked to special guest on this challenge is due to you NOT being afraid of anything, materials, challenges they all seem a breeze to you. What do you get out of challenges and any advice? I take challenges literally and I challenge my self to make something different then what I've already made before. In order to do just that, I use a variety of tools and materials, some of them are from the craft world and some are just fabrics or house hold materials and mix them all up. .
2. You use a lot of different items in your creations, some are regular household items and not commercially bought ones. Whats the strangest item you've used or altered? 3. Who/what/where do you find your inspiration? My inspiration has to be the world! I'm inspired by a variety of things, from outfits, color combinations, a state of mind like nostalgia, and other creative people. What inspire me the most is thinking about the person I'm making my craft for, a specific one or an imagined one (if it's for a unique challenge), that sometimes get me going, if by a color choice or a feminine / manly feel to the card. 4. What do you like most about the blogging community? First of all I love the fact that there are people like me that I can communicate with, people that enjoy creating and sharing their creations, that’s why I share my templates and things that I create. I also love all the feedback and the sense of a creative community that feeds each other with ideas and creative thoughts. 1. Always create with an open mind, even if you have a vision allow yourself to alter it on the way (some of my best work was made that way). Don’t be afraid to think out of the box with materials, it will give you a unique creation every single time. 2. Try to mix old with new, warm with cold, lace with metal, soft with hard etc… because they bring out the best of each other. 3. Enjoy the creating process; I do that by giving my self the time and the space to create, and giving my self an easy excess to every single material. Thank You very much Itzuvit! Don't forget to check out her amazing blog! Thank You all so much for your HUGE amount of entries to our Spring into Spring challenge, we had so much fun coming to visit you all and Thank You once again to Joanna Sheen for being our special guest & sponsor. Before we move onto our next challenge which is due to post at 12 noon gmt we'll announce the winners from the Spring challenge. Well Done Ladies, please grab yourself the Top 5 blinkie! I thought I'd do a post on the general etiquette of taking part in challenges on blogger. As it becomes bigger rules are changing so I'll show you the basics of how to enter into challenges and what to watch for. If you're an experienced blogger you'll know the ropes so just scroll down to the COMBINING CHALLENGES section as there's some changes you need to be aware of. Some blogs are far more stringent than others but remember the worst that can happen is your entry is void so to avoid disappointment follow some simple steps of what is expected. All challenge blogs will ask you to link to your actual creation, by this they mean the actual blog post with it in and not your entire blog. 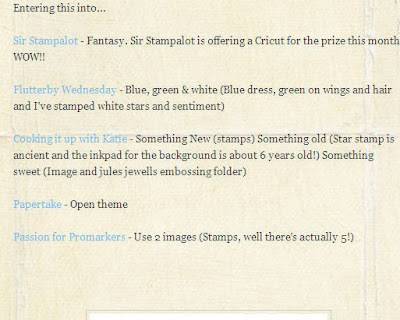 You can understand this rule as you may make a post a day and the challenge blog may not get round to viewing your creation for a week or two and have to scroll through looking for your entry which consumes a lot of time. Some challenge blogs will not even consider your entry if this isn't done correctly so have a quick read of the photo tutorial of how to do this, once you do it once you'll know exactly what to do and won't encounter any problems or void entries. After you have added your card and done your write up on your blog you need to identify the challenge(s) it is intended for. Type in the challenge name then use your mouse to highlight the text. 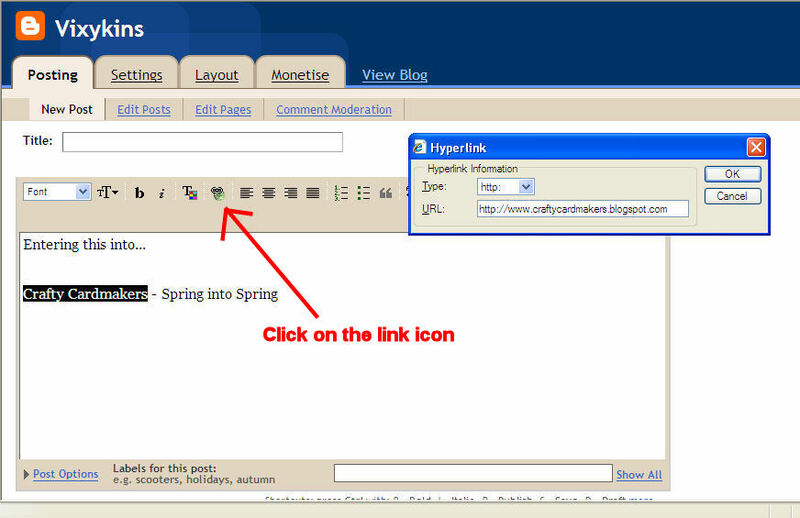 Your text should look like below on your blog with a clicky link through to the challenge. If you don't at least mention in the post it is for that challenge then when they visit they will not be certain the post is for them and your entry may be void. Some challenges allow you to enter as many others as you like whereas others have a limit which is usually stated in the rules on the blog. Please check individual rules for this when entering challenges. Crafty Cardmakers and Spotlight challenges have a limit of 10. 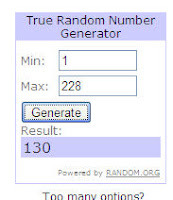 I personally thought it was one entry per challenge until I started to run here and got multiple entries for the same challenge so I had a scout round and asked friends who run blogs and the rules differ. It will differ from blog to blog so again look for the challenge rules and if not stated clearly please ask the blog owner. Some places are you can enter as many times as you like so long as the projects are different i.e. one card, one ATC, one altered item etc. 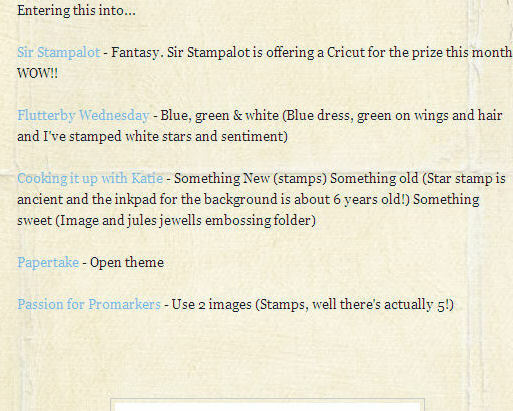 If in doubt about the rules of any challenge ask the blog owner, the worst that will happen is entries will be deleted. To quote our previous special guest Cindy Royal - "The paper crafting police will not come to get you." We will allow multiple entries at this stage as the team feel you may wish to have several gors at something. I hope you have a fun time on blogger as there are hundreds of fantastic challenges you can take part in and just have a go at.